This is a republished article from Next City: https://nextcity.org/features/view/yangon-myanmar-evictions-urban-cleanup-policies. I abridged it slightly. Myanmar’s young democratic government wants to remake slum clearance, but “new” tactics look unsettlingly familiar. Once or twice a day during heavy rains, this village of huts built on the outskirts of Yangon, Myanmar’s biggest city, is inundated with 2 or 3 feet of dirty water. The downpours drag litter and sewage up and onto the doorsteps of the hundreds of people who live there. Waterborne diseases breed in the filthy black water. The residents call this place 555, after a cigarette brand produced in a nearby factory. But, officially, the village doesn’t exist. Like many others, he moved to Yangon to look for work in the sprawling shantytowns that have grown up on the outskirts of the city. The suburbs are centers of industries that have begun to boom since Myanmar opened to the world in 2011. Factories cordoned off behind iron gates produce everything from salt to garments. But with a new government in power since April, the 555 residents are among hundreds of thousands of informal settlers facing an uncertain future as displacement looms on the horizon again. On the face of it, the policy sounds like a good one. Or, at least, a good-intentioned one. According to the government, it was dreamt up after Nobel Prize winner Aung San Suu Kyi and UNHCR ambassador Angelina Jolie visited Yangon’s sprawling slums together in 2015. These people live in abysmal conditions: Sense may dictate they should be picked up and moved somewhere else, somewhere better. In May, Myanmar’s new government, led by Suu Kyi’s National League for Democracy, which won a landslide election in November, suddenly announced grandiose plans to move Yangon’s hundreds of thousands of squatters off the land they have lived on, in some cases for decades. Those found to be legitimately landless would be moved to “rehabilitation camps,” Yangon Chief Minister Phyo Min Thein said, while so-called “anarchical squatters” and “professional squatters,” those renting out land to sub-tenants, would be evicted for good. 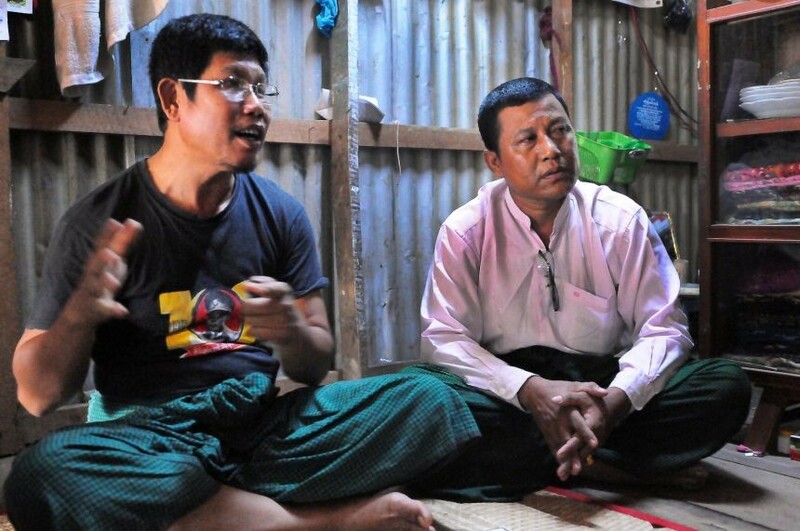 Squatters have no legal rights in Myanmar. While international standards devised by institutions like the World Bank guarantee compensation for not only legal residents but also squatters in the case of eviction, Myanmar does not enforce them. 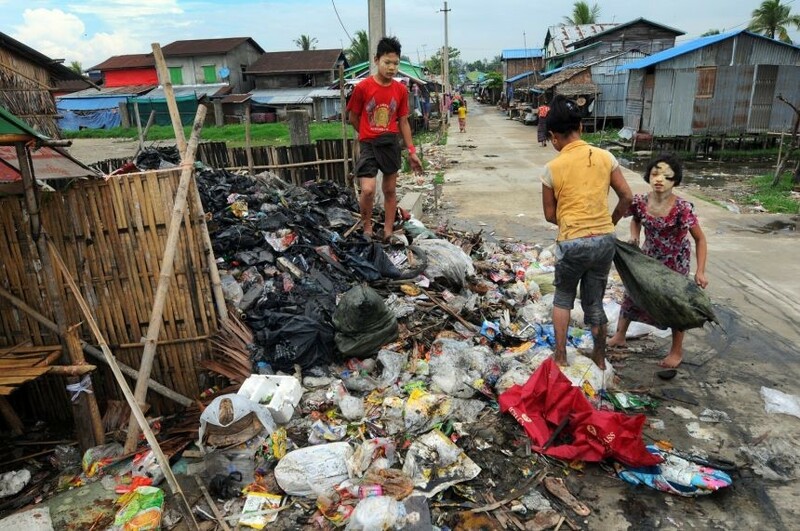 Children rummage through a pile of garbage looking for recyclable materials in Hlaing Tharyar’s poor housing area. Subsequent years brought tussles over the land. In 2012, he spent six months in prison for organizing protests against a planned forced eviction that was eventually suspended. The latest announcement was unexpected. “We got the news from the BBC about the government’s plan,” he says. The details are desperately vague. Lawmaker Aye Bo, who represents Hlaing Tharyar Township in Parliament, says that he has “no idea” about the future housing for the squatters. Local officials were equally unsure about the details. Local National League for Democracy representatives Nyunt Win (wearing Aung San shirt) and Hla Htay sit in the Hlaing Tharyar squatter settlement. Walking down a path past a cluster of ducks that quacked as they tucked into bags of abandoned rice, Hla Htay points to shelters indistinguishable from their neighbors: “These houses here are the real squatters,” he says. It didn’t take long to find a resident locked in a dispute with one of the informal landlords. Ei Shel, 30, leaned out of an empty window in her wooden shelter and stared with big, round eyes. The hut she shares with her husband and children stands on brackish water afloat with crushed tin cans and other garbage. She says she paid someone about $50 to move in. “Now he is saying that he didn’t sell to us, he let us live here for free,” she says, as two babies paw at her chest. They have no documents, or proof of payment, to stop him kicking them out, which she says he wants to do. Her husband earns about $8 a day as a construction worker, and they cannot afford to move. If they were forced to, she says she has no idea where they would go. Ei Shel, 30, holds her child in her Hlaing Tharyar home. While encounters like this are common, urban experts working in the area say that professional squatters make up a small minority of the population. Yangon is at an unusual turning point. The new government has a unique opportunity to avoid mistakes made by its regional neighbors. In the five years since democratic reforms swept the nation, its economy has grown significantly as have its cities, keeping with trends seen across Asia. While only one-third of the country’s population of 54 million live in urban areas today, that share is rapidly increasing as rural migrants continue to seek the opportunities that sent Nay Shwe to Hlaing Tharyar two decades ago. In Yangon, construction industry estimates pinpoint the influx to be around 330,000 newcomers each year. Projections from the World Resources Institute anticipate that by 2030, 48 percent of the country’s residents will live in cities that are certain to be even less affordable and denser than they are today. Slingsby has worked in cities across the region, including Phnom Penh, the capital of Cambodia, which confronted the kind of rapid growth and modernization in the early 2000s that Yangon is experiencing now. “[Phnom Penh] has faced the same problem of land speculation and so on that potentially we are facing here, so there are lessons to learn from Phnom Penh [that] are relevant to the development of Yangon,” says Slingsby. Without effective municipal services, even basic functions such as water-gathering and washing are time and labor intensive. Policies that treat informal settlers as objects to be shuffled around fail to treat them as agents of their own destiny. “So flooding is a problem here, but we can build a concrete road, so flooding for two or three hours is OK for us,” says Hla Htay. 555 might not exist, officially, and it might not be good land, but it is home. ← Previous Previous post: Making cities smart – a metropolitan solution?